"Since I studied GCSE Electronics I have wanted to pursue a career in engineering. After A levels I spent a year at British Aerospace Systems where I worked as a Student Engineer and rotated around the company. Not only was this fantastic experience but it also confirmed that I wanted to follow a career in electronics engineering. I chose University of Plymouth because it was in my home town, but also because of the great success rate of the graduates who obtain full-time employment afterwards. The degree course gave me many opportunities to network and plan my career. I met and worked with some great people. In my second year I joined the University Ladies' Hockey Team which gave me a chance to socialise, meet new people and keep fit. I also helped out on recruitment days, particularly with workshops focused around encouraging women to pursue careers in electronics. This was greatly rewarding. 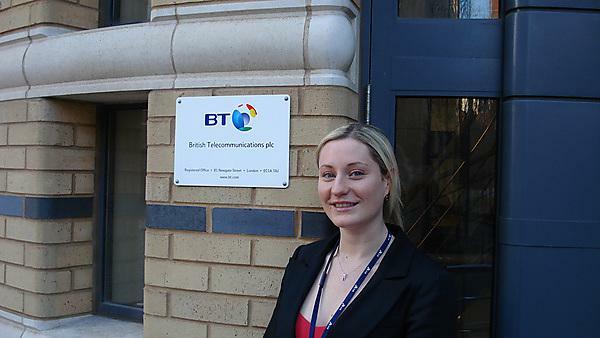 After graduation I was lucky enough to be accepted on British Telecom's two-year Graduate Scheme. As part of the scheme I am completing a recognised qualification in leadership and management and, as a result, will soon be suitably equipped to take on a management role. BT is a massive company and there are a lot of successful people who graduates can learn from. I also love the fact that I meet someone new every single day and have been able to travel all over the UK. The marketplace for women engineers is massive and there is often less competition to achieve roles. My advice for anyone would be to be confident with what you want and make the most of everything around you."